In June 1907, a drunk woman was arrested for shooting her sweetheart during a fight in a rooming house. It should have been a straightforward case, but things are rarely simple in SRO land, and the unravelling of loose threads soon ended the career of a young policeman. Right after the shooting, when things still seemed clear cut, the police told the press what they believed had happened. A newsboy called Buck Wilson and his girlfriend, Lena Carter, “an exceptionally pretty girl about 19 years of age” who, until recently, had been working in a massage parlor, had spent a warm Sunday afternoon and evening at Venice beach in the company of Buck’s roommate and his girlfriend, Grace Rhyn, “a few years older than Miss Carter and also very pretty”. When the party returned to the rooming house at 523 West Sixth street where Buck and his roommate lived, they were all drunk. Shortly after midnight, an argument between Buck and Grace Rhyn suddenly turned violent, and they started to fight. Lena Carter tried to intervene but Buck knocked her to the floor. At this, she ran to an adjoining room and procured a loaded revolver. She returned to the room where her lover and her friend were still struggling, aimed the pistol at Buck’s back and pulled the trigger, sending a bullet through Buck’s left lung. She fired again, but the shot went wild. The shots were heard in the street, which was soon filled with hundreds of excited people. The police had to force their way through the crowd in order to get to the apartment. Everyone present was arrested and taken to the police station, with the exception of Buck, who was taken to hospital. None of them would speak to the police, but Buck was eventually convinced to give some details of what had happened, which the police dutifully relayed to the reporters. But something wasn’t right, as became clear when a patrolman called Holden went to his superiors with a new piece of information. Patrolman Holden, who had pushed his way through the onlookers and made the arrests, had seen another policeman at the scene, Patrolman Charles Norris, a new officer who had evidently been there before the crowd had formed in the street but did not stick around to assist Holden. After Holden had taken the suspects to the station, he tried to contact Patrolman Norris to find out what he knew about the shooting and why he had left the scene, but Norris was nowhere to be found. According to the manager of Norris’s rooming house, which was just across the street from where the shooting had occurred, Norris had hurriedly removed all his belongings from his room and left for some unknown place. His strange behavior took on a more sinister cast when it was revealed that the gun that had been used to shoot Buck belonged to Norris. When questioned about the gun, Lena Carter admitted that Norris had been present, but maintained that she alone was to blame for the shooting. Late on Monday afternoon, Norris turned himself in at his police station and was immediately taken to the cells, where, that night, he told his side of the story. He had been walking home along West Sixth street when he heard people quarrelling in the building he was passing. He went up to quell the disturbance, and tried to pull Buck Wilson off Grace Rhyn. While he was leaning over, Lena Carter pulled his revolver from his pocket and started shooting. As he tried to stop her and get the gun back, Patrolman Holden entered the room, whereupon Norris fled, fearing implication in the affair. Why had he quit his rooms and gone into hiding? He could give no clear explanation, or at least none that was accepted by his colleagues. Norris was told that he would be suspended from duty and would likely be charged with assault with a deadly weapon. The next morning, an elderly couple arrived at the station — Norris’s parents, who knew nothing of his arrest and had become worried when they had missed him on his beat. The desk sergeant did not have the heart to tell the old people that their son was locked up and took them to a detective, who broke the news gently. “Mrs Norris said, with tears in her eyes, that her boy was good,” the police told the press, further saying that the father was an old soldier, “and proud of it”, and was ashamed that his son should be in jail. At the request of the district attorney, Norris was paroled in order to be with his parents while awaiting a formal charge. “When their son was finally released, the old couple straightened their bent backs and tried to walk proudly down the street. Even the policemen who are used to touching scenes could not help sympathising with the young man and his fond parents”. Norris and Lena were tried separately. At his trial, Norris finally confessed that he had known Lena Carter for some time, having met her when he walked a beat on Spring street, and had recently “spent two nights” with her, his wife being absent in Cincinnati. Further, he admitted that it was no accident that he had been in the room; Lena had sent for him on the night of the trouble, just prior to the shooting. Everything else, however, was as he had originally said: he had been trying to separate the brawling man and woman when Lena took his gun and shot Buck, and he had panicked when officer Holden arrived and had fled in order to avoid being dragged into the mess. If only Holden hadn’t recognised him. If only he hadn’t left his gun behind. If only he had never met Lena Carter. 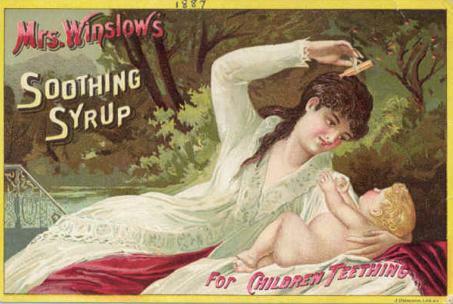 At Lena’s trial — at which it was revealed that her real name was Mrs Evelyn Ferguson (she had used the name Lena Carter “for convenience”) — she claimed that she had been frantic with worry that Grace Rhyn’s weak heart would give out during her struggle with Buck, and had simply used the quickest means possible to stop the fight, never meaning to hurt him so seriously. Her story was undermined somewhat by testimony from a neighbor that she had cried, “Let him die!” as Norris had tried to help the wounded man. The police court accepted that Norris had no part in the shooting of Buck Wilson, but took a dim view of his disgraceful disappearance following the crime. He would face no criminal charges, but he would never work as a police officer again. Sources: Los Angeles Herald, June 10-13 and 26; July 19. Officer Gifford, on night patrol on Crocker street, heard a call for help and saw three men chasing another man down the block away from him. As he set off after them, Gifford saw the man in the lead leap up the steps at the entrance to the emergency hospital, just as the foremost of his pursuers tripped and fell on the sidewalk, sending his pistol skidding across the cement. At this, the one who had been being chased ran back down the steps, snatched up the gun and pointed it at the prone man. By the time Gifford reached the entrance to the hospital, the other two pursuers had run off, but the man who had tripped was still there, held at gunpoint. Both men started shouting at Gifford to arrest the other, so he did the only sensible thing and arrested both of them. The man who had been being chased was S Mahoney, a railroad engineer employed by the Santa Fe, who lived at 415 Crocker street. The man who had tripped was H A Smith, who turned out to have been a special police officer until he had been dismissed for certain unspecified irregularities. Despite the fact that he had since taken up work as a deputy constable, the police and detective agencies regarded him as “a bad man”. Indeed, a few days previously, he’d been involved in an abortive bit of gunplay involving a detective whom he’d met in a saloon. After threatening him “with all manner of evil”, Smith had gone for his gun, but the detective had been quicker on the draw and Smith had found himself being escorted out of the saloon at the barrel of a Colt, which would make Mahoney the second man in a matter of days to be on the point of shooting Smith. Mahoney told the police that, after catching a show at the theater, he’d gone to a saloon on Fifth street, where he’d met Smith and his two companions, with whom he’d shared a few drinks. When he was on his way home, he realised that his former drinking buddies were following him and increased his speed, at which the three men did likewise. As he drew near to the building where he lived, Mahoney heard Smith shout, “Stop or I’ll shoot!” which he took as his signal to start running and crying for help. The police released Mahoney. 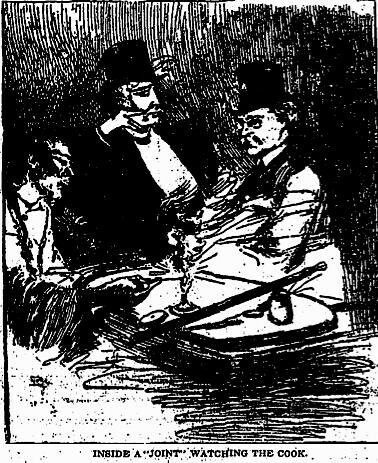 Smith was taken to the cells and the two men who’d fled — known associates of Smith’s called Charles Burrell and William Jasper — were arrested the next day. At the trial in police court, which took place a month later, Smith finally got a chance to tell his side of the story. 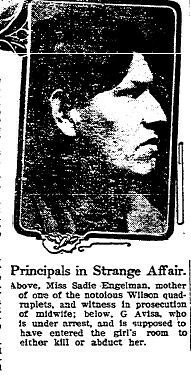 He explained that, while having those drinks with Mahoney, he had formed the view that Mahoney was a suspicious character deserving of further investigation. In particular, Smith explained, he had doubted Mahoney’s word when he said that he lived on Crocker street, and had decided to follow him when he left the saloon in order to verify the truth of the statement. However, owing to the investigators’ consumption of alcohol, their surveillance technique might not have been as covert as it might otherwise have been and they evidently alarmed Mahoney, who thereafter misinterpreted their calls for him to stop so they could explain their presence as calls for him to stop so they could rob him. Misunderstanding had piled on misunderstanding, according to Smith, resulting in the regrettable situation in which a terrified Mahoney had ended up holding a gun on a slightly inebriated but otherwise diligent deputy constable lying stretched out on the sidewalk outside the emergency hospital. Faced with two conflicting accounts, which overlapped only to the degree that each party agreed that the other parties had been drunk, the police justice dismissed the charges. The question of whether Smith was a bad man or merely a bad law enforcer remains unanswered. 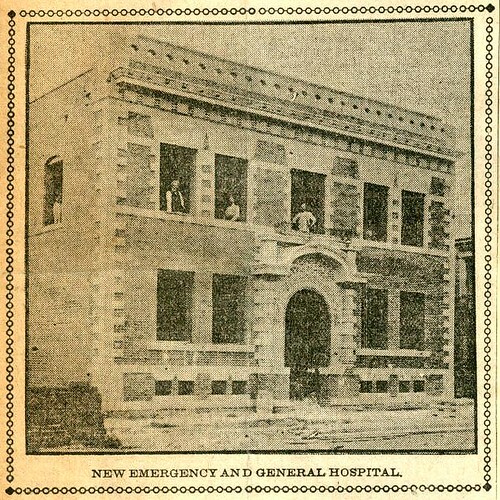 Sources: Los Angeles Herald, Nov 19, Nov 20 and Dec 13 1906; Photograph of the emergency hospital from the Claremont Colleges Digital Library. 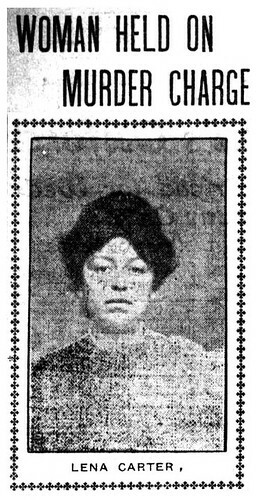 From the women’s description, the police identified the beggar as Lizzie McGuire, who was well known to them, and not only because she had survived being shot some years ago by her boyfriend, Paddy Walsh, who was now serving a sentence in San Quentin. 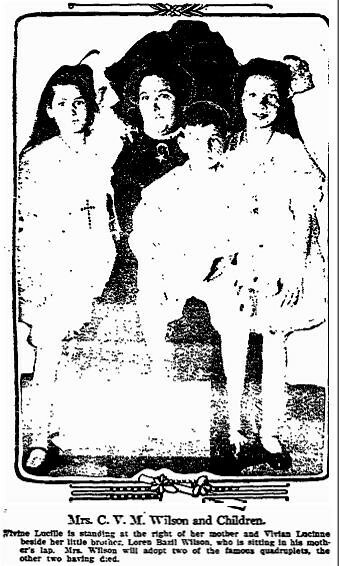 They suspected that she had taken the little girl either to hold her for a reward or to carry along with her on one of her periodical begging tours of the country. The latter possibility was bolstered when they discovered that Lizzie had fled her quarters in a rooming house on East Second street the day before. 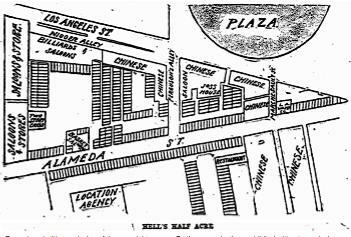 While police departments across southern California were contacted with details of the case and photographs and descriptions were sent out of Toto and Lizzie, a detective called Roberds doggedly searched second-class lodging houses downtown, following a sighting of the woman on the corner of Fifth and San Pedro. 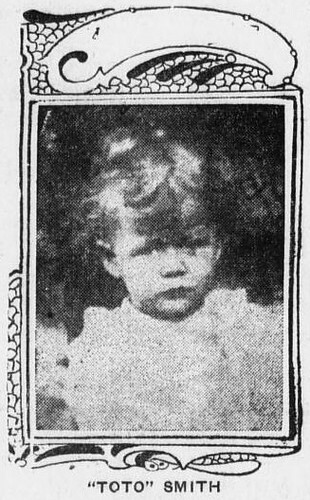 Five days after the abduction, during which time Lizzie had dragged the child around various run-down establishments in an attempt to evade capture, Detective Roberds tracked her down in a dingy room in 644 San Julian street. 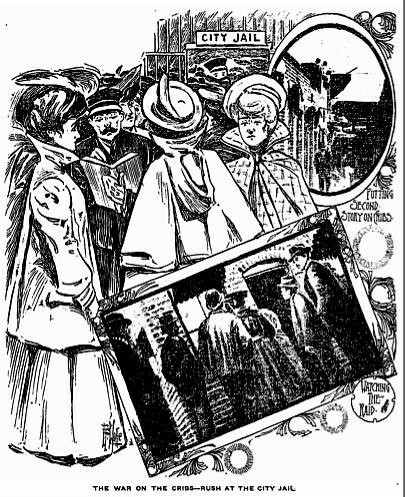 Lizzie, who “sullenly refused to say anything to detectives when her lair was discovered”, was arrested. 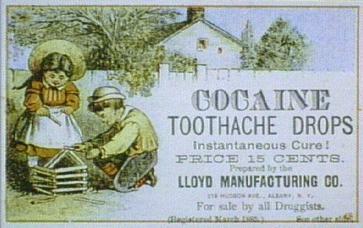 However, as the police had known all along, she would never be prosecuted. She had survived her boyfriend’s attempt to kill her all those years ago, but she hadn’t exactly come through unscathed — the shot that he’d fired had hit her in the head, leaving her not only with a bullet scar on her forehead that made her detection by the police far easier than it would otherwise have been, but also with a brain that didn’t quite work as well as it used to. The prosecution was over before it began: Lizzie was deranged, and therefore mentally unfit to stand trial. And Toto? She was returned to her tearful mother, apparently physically unharmed, although she appeared wan and was “sadly in need of a bath”. 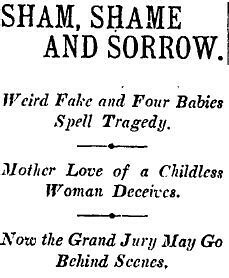 Sources: Los Angeles Herald, April 20 and 21, 1906. They weren’t pretty but they sure were cheap, and easy to find. All an Angeleno had to do to ease his itch before the turn of the century in LA (or maybe pick up another one) was head downtown to Alameda and Ferguson Alley to an area known as the Cribs. 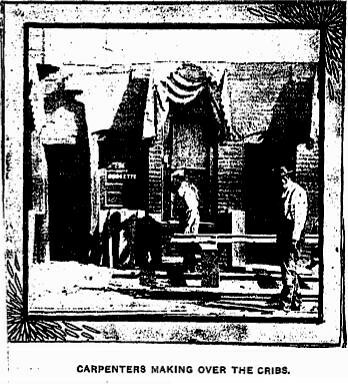 There, in the tenderloin, you’d find a rookery of one-story shacks divided into even smaller compartments, called cribs, which were rented to “fallen women” of all nationalities for $1.50 to $3.00 a night. The ploy, designed to skirt the most recent in a series of crackdowns on vice in the crib quarter, didn’t hold up for long. On February 5th, police raided Cribtown and arrested 17 women for vagrancy. The patrol car only had room for 13 prisoners, so the remaining four were led on foot to the police station, followed by a crowd of saloon bums and macquereaux (pimps, or macks). Chaos ensued in the station, where the booking desk sergeant struggled to record the incomprehensible names of the French and Belgian prisoners. The majority of the women were released on bail before nightfall, put up by the main landlords of the cribs, who shelled out nearly 4 thousand dollars for their return. 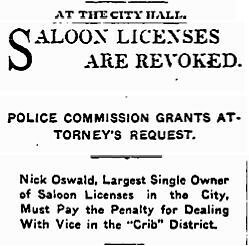 A few months after this bust, the crib district finally went dark when the police, clergy, the Salvation Army, and women crusaders allied to shut down the saloons that anchored the neighborhood.